I had several hours of clear skies, still relatively dark before the moon rose, and I set up the William Optics GT81 and ZWO ASI071MC color camera to take a bunch of subs of M33 and M45--Triangulum Galaxy and the Pleiades, two of my favorite targets this time of year--but this is my first time shooting these with the ZWO ASI071MC cooled color camera, and the resulting images show how amazing the ZWO is. (ZWO ASI071MC running at -10C, William Optics GT81 + WO Flat 6A II f/4.7, iOptron CEM25P EQ mount, Orion OAG + ZWO ASI120MM-S guide cam, Stellarmate OS (INDI/KStars/Ekos) running on Raspberry Pi 3b+). 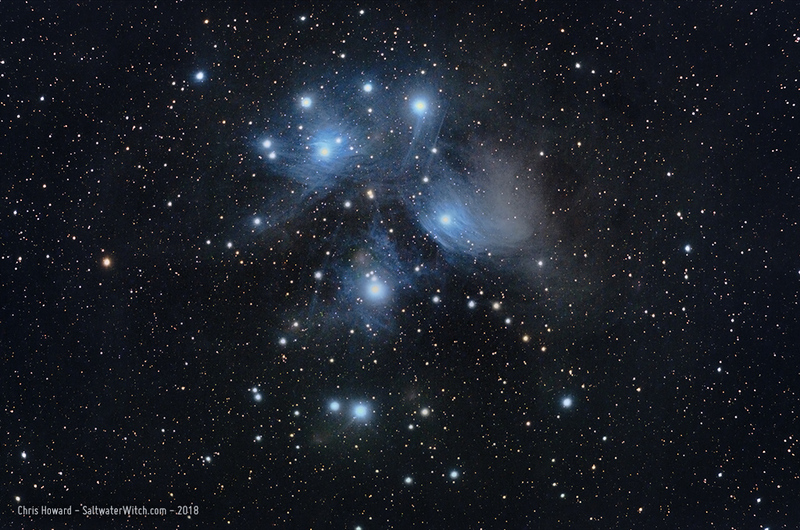 The Pleiades, M45, also known as "The Seven Sisters" and in Japanese as Subaru (昴). It's one of the most identifiable objects in the night sky, but it's more than just a loose group of stars. Located in the constellation Taurus, the Pleiades is a nearby open star cluster mostly made up of a batch of relatively young B-type stars amid (or behind) a reflection nebula that appears to surround and fill the space between the stars with veil-like sheets and threads. (WilliamOptics GT81, ZWO ASI071MC: 60 x 60 second and 60 x 120 second exposures, unity gain). 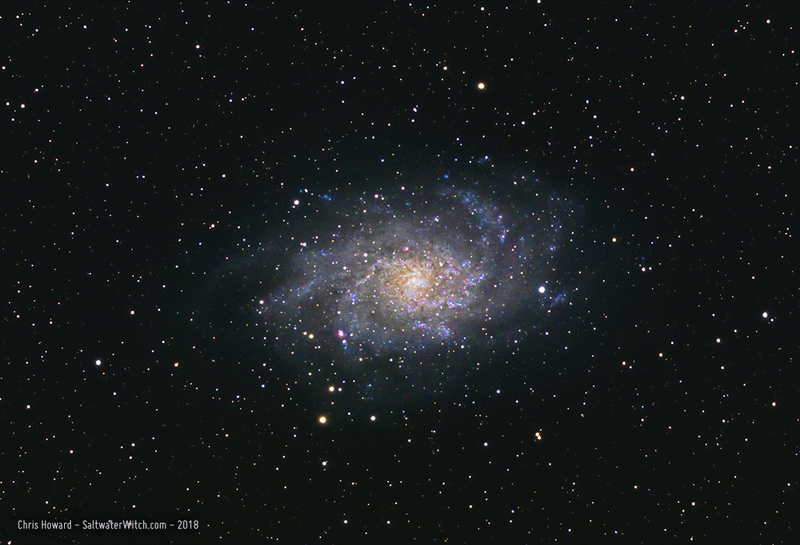 Triangulum Galaxy, M33, is a nearby spiral galaxy--around 3 million lightyears away, with as many as 40 billion stars. It's the third largest galaxy in our local group, and appears to be bound up in Andromeda's gravitational pull. It also contains some amazing nebulae and other deep space objects, e.g., NGC 604 is a massive H II region--that's the bright pinkish blob, the size of a large star, at the lower left side of the galactic spiral. Keep in mind that nearly every star-like point of light in this image is actually a star in the Milky Way, our own galaxy. (WilliamOptics GT81, ZWO ASI071MC: 90 x 60 second exposures, unity gain). The three central and brightest (low magnitude) stars in the open star cluster M45, called The Pleiades or The Seven Sisters: Alcyone (upper middle), Maia (right), and Merope (left). The light of the stars in the Pleiades pass through and illuminate a cloud of dust in the interstellar medium. 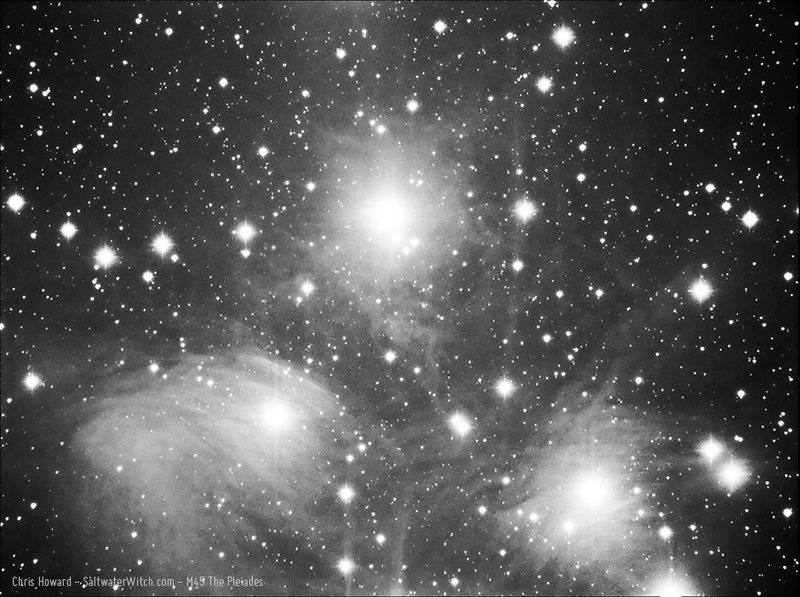 (8 x 5 minute exposures, 18 dark frames - William Optics GT-81 478mm FL, Atik 414EX Monochrome CCD, Baader luminance filter, CEM25P EQ mount).